Capital Books (VA), 9781933102566, 239pp. Hitting Your Stride advocates learning how to use your uniqueness at work the best of who you are to be rewarded with interesting work, personal growth, and financial gains. Nan shares her 10 Winning at Working Lessons common sense, but uncommon practices, ways to help you reengage your talent, create your own luck, differentiate your work performance, and make a difference at work. Nan's stop-wishing, start-creating approach offers savvy insights to help you get ahead, enjoy working, and achieve financial rewards. Her motto: Opportunity is anywhere and everywhere. While wishing and hoping makes you a dreamer, acting and doing makes you someone who can create your own luck and turn your dreams into reality. Using a story-telling approach, mixed with commentary, analysis, and reflective exercises, Nan identifies mistakes, struggles, disappointments, failures, and successes in the workplace. 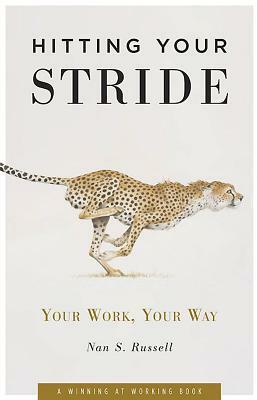 Hitting Your Stride is an inspiring business-and-life book, with an individualized approach to bringing the best of who you are to work from someone who has been an employee, a manager, and a senior executive. It reinforces the message that whether or not you climb the corporate ladder, winning at working is individual. Hitting Your Stride will help you find your way there, along your own path and with your own style. WINNER 2009 Silver Medal Award winner in the Success/Motivation category: AXIOM Business Book Awards.